WASHINGTON — Fairfax County Fire and Rescue crews crossed quick-moving waters to help motorists stranded in their vehicle in the Vienna, Virginia, area Wednesday morning. The driver and a passenger got trapped around 9:50 a.m. after following two other vehicles onto the inundated part of Browns Mill Road, covered in the bloated, swift-flowing Difficult Run. Fire officials said the water then knocked out the engine of the rescued driver’s car and swept it against an obstruction that kept it from floating away. First responders rescued both occupants of the car; video of the rescue showed the area’s dangerous, flooded conditions. Fire officials also said that another driver had earlier removed a protective barrier in the area, and that it was the second rescue in the area in less than a day. 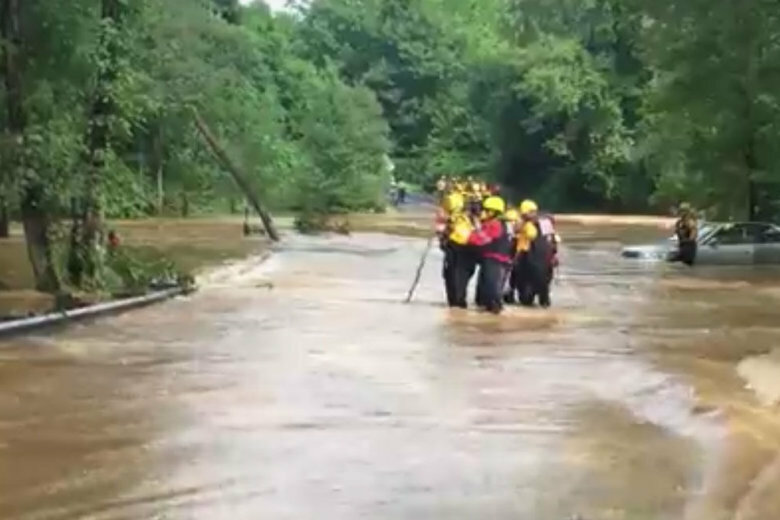 According to Fairfax County Fire and Rescue, crews responded to five “swift water rescues” between 3:20 a.m. and 5:48 a.m. Wednesday, with the 9:50 a.m. call being the sixth call of the day at that point. Drivers are reminded to not remove barriers and to stay away from flooded roadways.